First Ever Butler Ford “Drive One 4 UR Community” Event! You’ve heard us talking about, promoting, and thanking you for all your help in our bi-annual Drive One 4 UR School events. Drive One is a Ford sponsored program that partners dealerships with local schools to raise money for sports programs and other extracurricular activities. Now, for the first time in the U.S. Ford’s expanding that program to include community organizations! 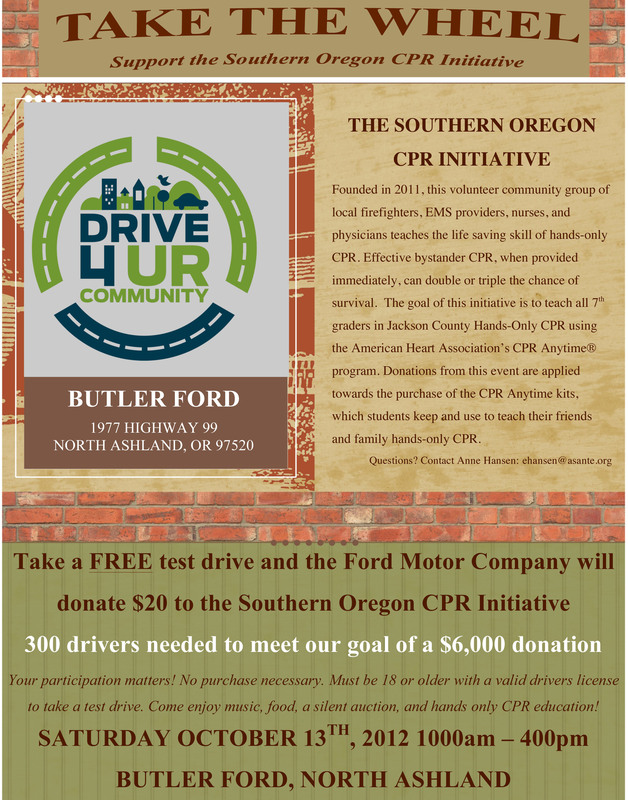 And Butler Ford’s getting in on the action with a Drive One 4 UR Community event to benefit the Southern Oregon CPR Initiative, a volunteer group of local emergency responders and medical personnel who’s goal is to teach Jackson County 7th graders life-saving CPR skills. Come join us Saturday, October 13,, 2012 right here at Butler Ford in Ashland to test drive a Ford and earn $20 for the Initiative. You can also participate in a silent auction, raffle drawing, and CPR demos while enjoying a live remote broadcast by a local radio station and delicious food from Al’s Fresco truck. It’ll be such fun! Come see us to support a great local organization!